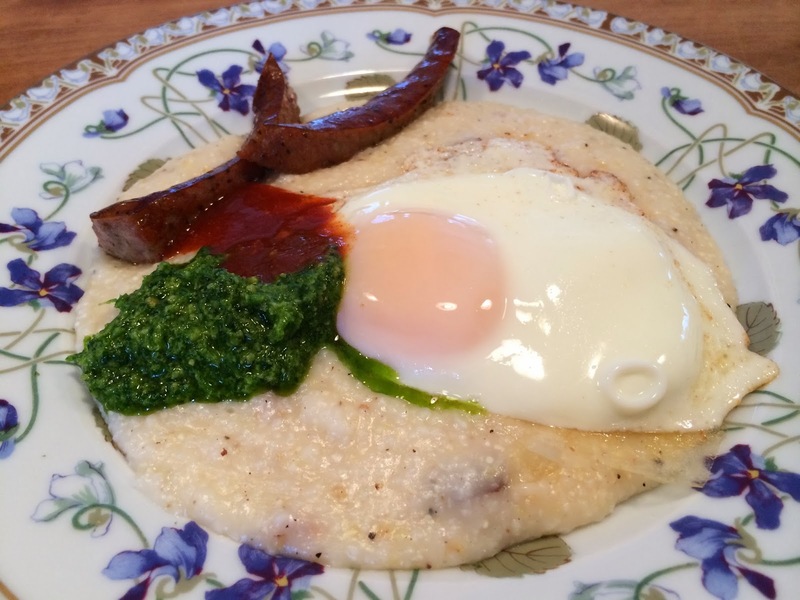 Might as well have a great breakfast as long as there aren’t a lot of reasons to hit the trail early these days in Vermont…and these grits will make you glad you did. After all, is anything with lots of cheese and butter ever bad? Whisk a cup of grits and a teaspoon of salt into four cups of boiling water and simmer gently for approximately 30 minutes. While that’s going grate a cup of sharp cheddar along with a quarter cup of parmesan and set aside with three tablespoons of butter and a teaspoon of freshly grated black pepper. Crisp up your Andouille or sausage of choice and when your grits are ready remove from the heat and stir in the cheese, butter and pepper along with a few shakes of tabasco sauce. Fry the eggs in butter on low heat in a covered pan making sure to keep the yolks runny. While they’re cooking plate your grits so you’re ready to go when the eggs are done and serve all with your hot sauce of choice and enjoy. These grits are well worth the mess for breakfast or dinner.